Team Monster, which included Virginia Stanton (JD ’19), Andrew Shortt (JD ’20), and Phillip Jester (JD ’20), as well as Team Mamma Bear, which included Tracea Rice (JD ’19), Darius Lamonte (JD ’19), and Shameka Rolla (JD ’20), were coached by Mark Boynton (JD ’97) and Aindrea Pledger (JD ’10). After the Demon Deacon’s historical first- and second-place finish in the 2018 national competition, Wake Forest Law was colloquially the “one to beat,” according to Coach Boynton. Team Monster had three hard-fought trials and ended the preliminary rounds with one win and two losses, but nevertheless finished the competition with the second-highest point total and third highest point differential among all 20 teams. Stanton received the Outstanding Advocate Award with the 4th highest score total of all competitors. Team Mamma Bear finished the preliminary round with an undefeated record, allowing them to enter the next round as the No. 1 seed. The squad later faced William & Mary and prevailed in a 3-2 decision. Rice and Lamonte would end up defending against the home team, South Carolina, but would end up losing in a 2-1 decision. For the second year in-a-row, Rice was named the Best Overall Advocate of the tournament. Stanton and Rice, with their multiple campaigns at the NTC, their championship experience at the Tournament of Champions (TOC), and numerous individual awards, are now two of the most decorated student trial advocates in the nation and in school history. 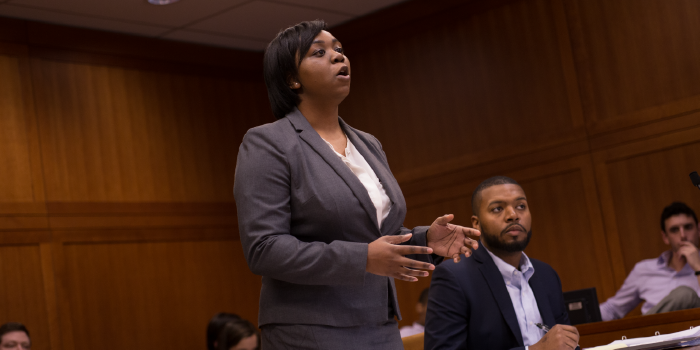 Lamonte, who was undefeated in competition for eleven straight trial competitions, will also graduate from Wake Forest as a distinguished trial advocate. Since 2017, Wake Forest School of Law has brought home four national championship in just two years with the National Trial Team most recently winning the 2018 TOC in October. The win makes Wake Forest the only law school to win the AAJ Student Trial Advocacy Competition, the National Moot Court Competition, the American College of Trial Lawyers National Trial Competition, and the Tournament of Champions in consecutive years.